Osprey Viking Sword, Tempered What's this? The Osprey is the emperor of Viking swords. 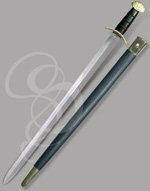 Slightly larger than typical raiding swords, this sword has an amazing swept guard that stretches a good five inches to each side. Nickled and flared at the edges, the guard gives this noble sword a regal appearance. 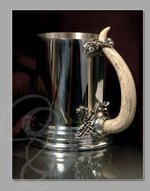 The kings of the Vikings, clan leaders such as the wise and battle hardened Gothar would have swung brilliant swords such as these. The focal point of the sword is, of course, the sweeping, wing-like guard that slopes away from the grip. But the sword has a classic lobed pommel, nickled and bright, and a ridged grip of wood wrapped with rugged, double-stitched black leather. The blade is a wide and durable hand-forged carbon steel with a thick and shallow fuller. The edges, like most viking swords, run nearly parallel for most of the length of the blade, beginning its taper only as it gets near the tip. 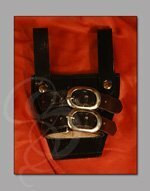 The scabbard is leather-wrapped wood with fine nickled metal collar and tip. Most viking swords we see are squat and rather plain, which is the way the vikings liked them. This sword however has a strong sense of nobility and character that is hard to find. Graceful yet powerful. 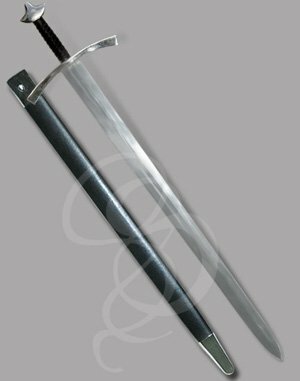 One of our finest swords at this price range. I ordered this model to use as my "prayer sword", and had Eph. 6:10 engraved on the blade in a Celtic scroll frame. It is magnificent! It is mounted on my wall when not being used, and it is a beautiful addition to our decor, and to my life. I can't recommend this company enough. They quickly answered my questions, helped me pick the right scroll/frame for the sword,and it was shipped within a week, even with the engraving. So well done, I will definitely be back to purchase one for my husband, probably for Christmas this year. Purchased about 2 months ago. The blade was not a sharp as I expected and it's starting to exhibit some flat surface corrosion. The sword is still a great buy for the money. I got this as a wedding present for my friends and it was beautiful and they loved it and even used it to cut the cake! I keep wanting to put it to the test, see what it can take, but it just looks so good I don't want to mar it .EveeythEvei can feels right, the flexibility of the blade, the balance, nicely polished and even the balance is rather good .Don't want to give Strongblade any ideas by saying this, but it feels like a blade worth much more. I've always been a fan of quality, realistic swords that are more functional than fancy. This sword is very nice looking while also being extremely solid and functional. I've easily paid twice what it cost for other swords of comparable quality. I'm already looking forward to buying my next Strongblade sword. I got this sword for I needed a sword for filming. I got it tempered and boy let me say this.... Awesome sword. It held up it is a true battle ready sword. The price is right. The sword held up to the light sparing (not like the other sword that was used. That cost more). It was a great buy and I am very happy with it. I needed a high quality sword with an engraving, and, man, did they deliver! It's extremely sturdy, the steel is exceptionally shiny, and it is comfortable to hold. Both the blade and the scabbard are high quality, and are sure to stand the test of time. They even called me to make sure that the sword would come by the date I needed it. I'm extremely pleased with the service, quality, and speed of my order. If I ever need another sword, I will definitely be coming back here! They arrived... and My God! What amazing work you guys did! The swords alone are incredibly impressive! They certainly surpassed my expectations, the craftsmanship of every part of the sword is incredible! The stitching on the handle just puts the icing on the cake! The pommel and wingspan of the guard are also truly impressive. The swords are pretty much exactly what I wanted. The engravings literally could not have looked any better than you guys did them, just great work. It's pretty clear you folks at Strongblade take a lot of pride in your work. Anyway, I do hope to have some pictures taken with the groomsmen on the wedding day with the swords that I would be happy to forward to you. As well, if you ever need a reference, please do not hesitate to send your prospect my way, or just ask!